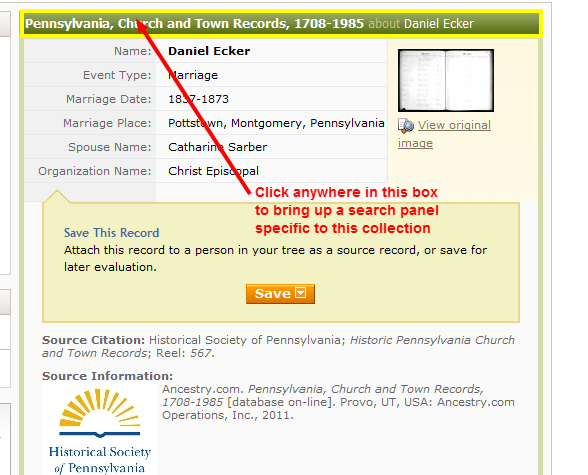 I have to say that between the new “Pennsylvania Church and Town Records, 1708-1985” Collection on Ancestry.com and the “Pennsylvania County Marriages, 1885-1950” on FamilySearch.org I have been filling in so many “blanks” that I’ve lost count! I’ve been finding exact birth, marriage and death dates, names of parents and maiden names of spouses! I’ll probably blog about some of my specific finds soon, but for now I wanted to post a quick tip on searching the Church and Town Collection on Ancestry. I then click on the top result and view the image. 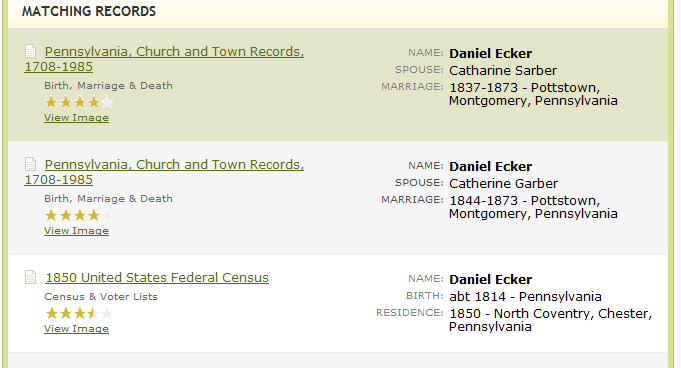 It turns out to be Daniel’s marriage record in the church register of Christ Episcopal Church in Pottstown, Montgomery Co, PA. Now I’m thinking I want to see what else I can find in that particular church register. Unfortunately, there’s no direct way to search just that register – the best you can do is limit the search to the entire “Pennsylvania Church and Town” collection. But there is a way to get almost what you want by setting the search parameters appropriately. First, limit the search to the “PA Church and Town” collection. You can do this through the card catalog feature, but I find it a lot easier to do by clicking on the banner as shown in the image below. 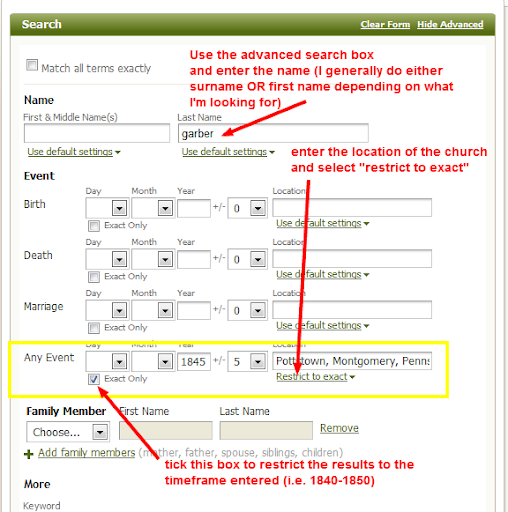 The key thing here is to use the advanced search, then on the “Any Event” option, set the location of the church and “restrict to exact.” You could also set the year and range and click “Exact only” to further limit the scope of the query. As I have the query set up, Ancestry will only return results from Pottstown, PA. This limits the number of churches to only those in Pottstown and greatly increases the chance that the results returned will be relevant. Obituaries – A Great Genealogical Resource! I love reading obituaries – particularly old ones! Okay, in terms of the general population, I guess that’s a little strange. But for the average genealogy buff/family historian, it’s probably normal. In fact, if you visit my genealogy website, you can find many obituaries that I have transcribed for my various family lines.